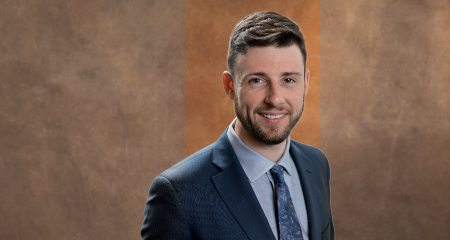 Spencer Owen | Owen, Wickersham & Erickson, P.C. Spencer Owen is an associate at Owen, Wickersham & Erickson. His intellectual property practice focuses on trademark and copyright matters, including counseling, clearance, prosecution, enforcement, licensing and litigation. Mr. Owen earned his law degree from the University of Oregon in 2017, where he was awarded a certificate of specialization in Intellectual Property, served as president of the student intellectual property interest group and the Moot Court Board, and worked as a teaching assistant for first-year Constitutional Law. Prior to law school he received a B.A. in Philosophy with an emphasis in Ethics and Public Policy from the University of California, Santa Barbara. Shortly after college he received his paralegal certificate and worked as a paralegal for a solo practitioner in Santa Barbara before deciding to go to law school. When not working, Mr. Owen can be found rock climbing, hiking, or baking sourdough bread.